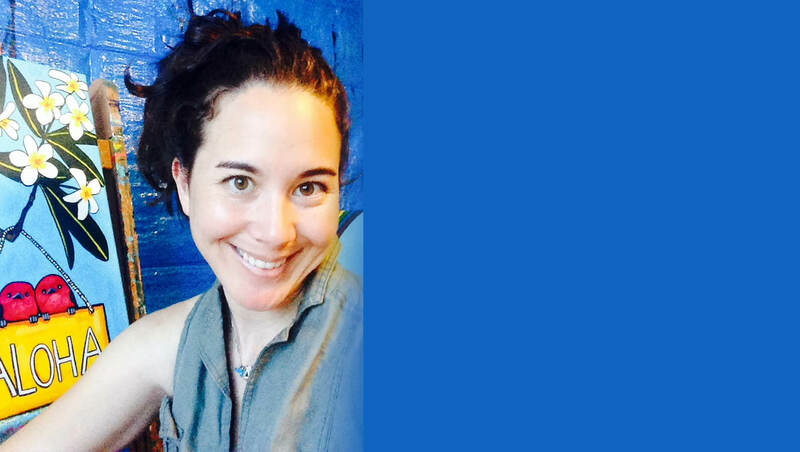 Karen Obuhanych was raised in California where she enjoyed playing sports and doing anything creative. 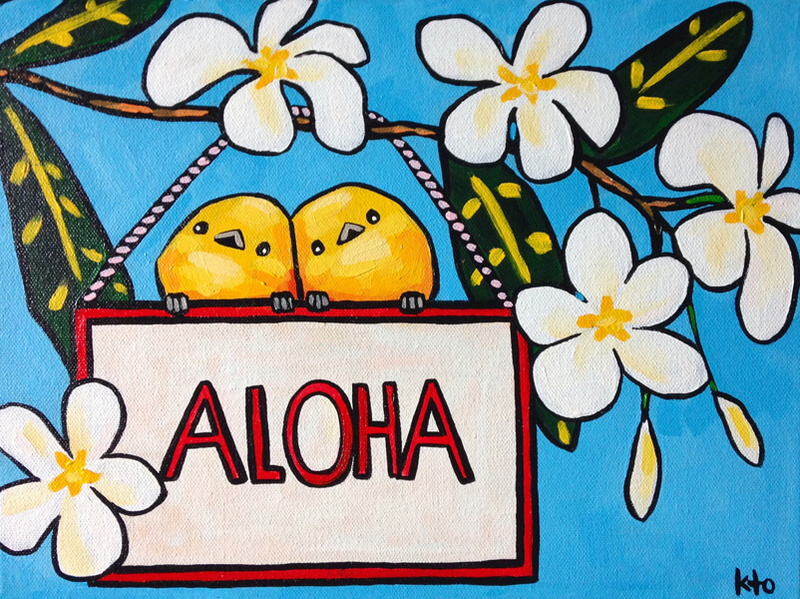 Inspired by annual trips to Hawaii, where her father grew up, Karen moved to Oahu to attend the University of Hawaii at Manoa and graduated with a Bachelor of Fine Arts degree in painting. Karen Obuhanych was raised in California where she enjoyed playing sports and doing anything creative. Inspired by annual trips to Hawaii, where her father grew up, Karen moved to Oahu to attend the University of Hawaii at Manoa and graduated with a Bachelor of Fine Arts degree in painting. Karen currently resides on the Big Island of Hawaii. “Strictly For The Birds” is a collection of acrylic bird-themed paintings. 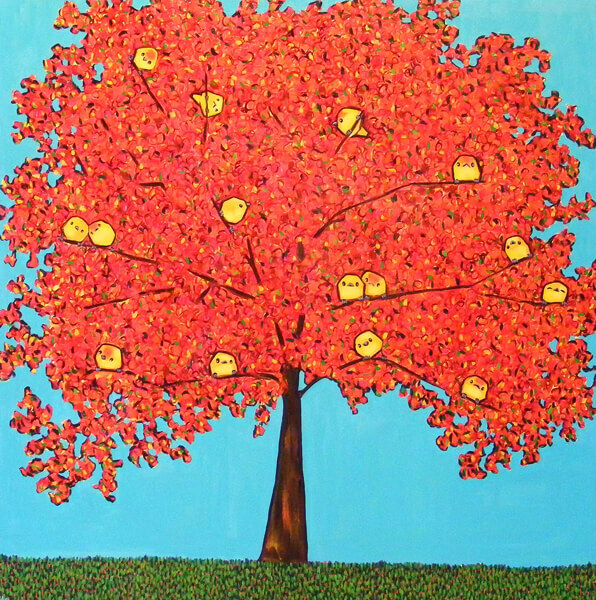 Each painting has its own personality and the collection as a whole embraces color, whimsy and happiness. 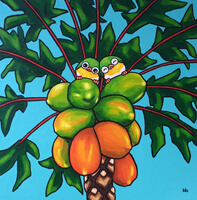 Karen prefers to paint birds found in Hawaii and the mainland USA, drawing from the playful character of birds and how they relate to human behavior. 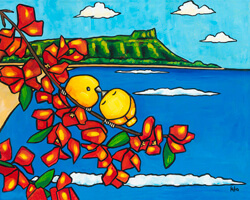 “Ke Aloha (Beloved)” is a series of paintings featuring Hawaii’s endemic and endangered bird species. Each painting is composed of two lovely birds kissing to create a heart shape. Hawaii has been home to over 150 endemic bird species, but less than 40 species still exist and over half are endangered due to habitat destruction, invasive species and disease-carrying mosquitoes. Conservation projects are attempting to save the surviving species and hopefully raise their numbers to a safer level. 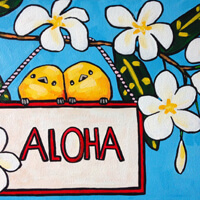 kto ART is donating a percentage of profits from the Ke Aloha Series to conservation efforts to help these incredible birds. “Fruits of Nature” and “Raining Cats And Dogs” are two more series that showcase Karen’s penchant for vibrant color and capturing the simple joys in life. 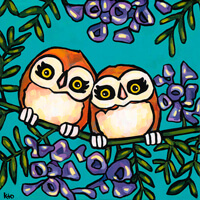 Karen’s art “kto” can be found in a select group of fine art galleries from the Mainland to the Hawaiian Islands. 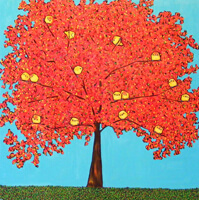 As her artistic range and subject matter continue to grow so does the demand for her cheerful, and heart-felt artwork. 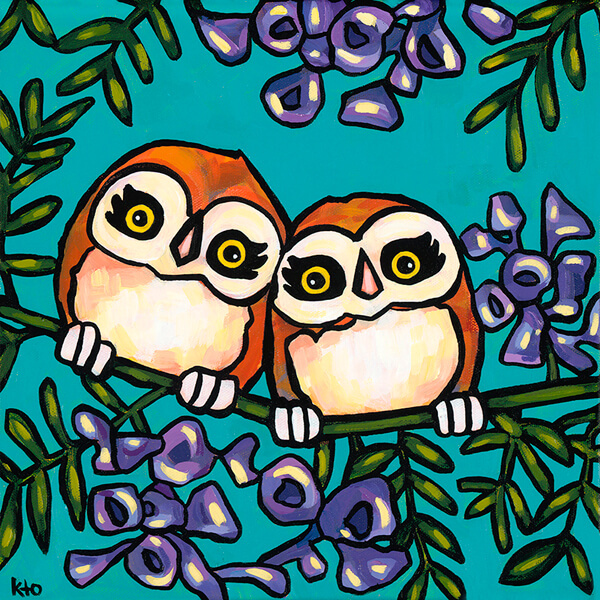 Collect a beautiful “kto” painting and embrace the splendor and creativity of the world around us. She is a young talent with a bright future.